9.4" x 5.1" x 1.7"
Pros: Runs pretty fast and has been stable for me for over a year. For $200 at the time, it wasn't a bad value. Cons: It's an aging card and is starting to struggle with some of the very latest games. It does run Battlefield 3 with most settings on ultra at 60+ fps pretty consistent, but it fails to maintain even 30 fps in games like Planetside 2. Other Thoughts: It's served me well, but it's probably time for an upgrade soon. on overclocking,this thing is a beast! I have it running at 1106MHz GPU clock and it amazing. I only have to run my card's fans at 75% to keep the overclock stable. Cons: By its own with no overclocking, this card won't play games maxed out at 1080p,which is sad. But if you overclock or run it in an SLI maxed out 1080p shouldn't be a problem. Pros: Excellent! Super powerful and very quiet! Pros: Fast card, reasonable price. Cons: In 2 of them the fan began to rattle at 70%+ speed after about 3 months. And card is breaking down and becoming more unstable month by month. Other Thoughts: I have two identical systems running these cards in SLI. So I own FOUR of them. Almost exactly at the 1 year mark I started experiencing very random hard freezes (reboot required) in games while running in SLI mode. Even while running the second card as just a Physx card. These freezes would happen between 5 minutes and 5 hours. I swapped cards with my other machine and it kept happening so I thought it may have been another component malfunctioning, but I was wrong. Turns out both machines were experiencing the same lock ups. My second machine was just a little more stable since it's seen less use. It took me about 200 hours and nearly $300 bucks to figure out that without a shadow of a doubt it was the graphics cards causing the lock up. So that's 2 fan rattles, and 4 failing cards after 1 year. I'd say that's a pretty big negative. Thank you for your comments. We apologize for your difficulty with your Gigabyte product. Please contact us at newegg-support@gigabyteusa.com with the case number 88757 in the subject line. We will provide personalized service and analysis to help solve your issue ASAP. If the matter is urgent, please send us your contact number, and we will contact you. Pros: Works Great, Meets or exceeds my expectation. Other Thoughts: Would recommend to other. I have never been disappointed by any of Gigabytes products I use as much of their products in my computer builds as I can get. Great products. Pros: Great price for a this type of card. Wicked looking Cooling fans. Super easy installation (As long as you have room...more on this later.) Handles nearly all modern games without issue on high resolutions. Run quieter than most GTX cards even under load. 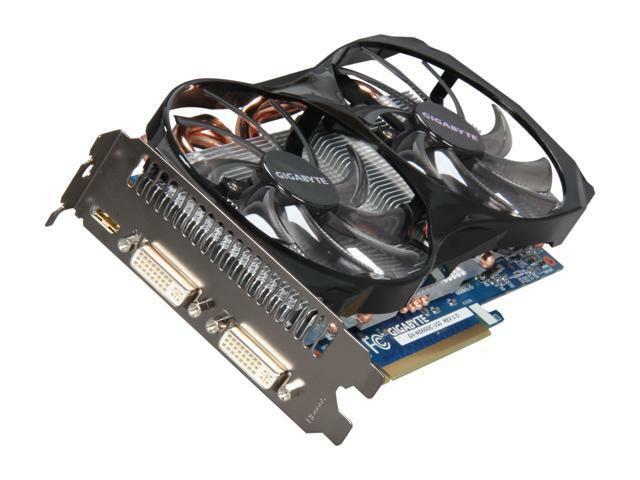 This is the card for those looking for high performance with a budget. I have put this card through the ringer with many different games including BF3 and it handles all of them well. Cons: Cards cooling fan assembly may be a minor problem for some motherboards and/or cases...especially if you plan on using two of these bad boys in SLI. It may be a tight fit with the SLI bridge connector. Cooling fans at high speed (under load) may be a little too loud for some. You may have to download the latest drivers from Nvidia in oder to get the max performances out of this card. Other Thoughts: I have built many gaming rigs for myself and others and I have tested and used countless video cards from both ATI (AMD) and Nvidia and out of them, maybe a handful I considered to be the "Best Bang For You Bucks" cards...this would be one of them. Pros: Installed this card, and it has been problem free completely. Works great for everything I throw at it.